Sometimes stats can mislead but to glance at the data of today's game would tell you that Wales fully deserved this. Alisha Butchers and Mel Clay racked up 33 successful tackles each during the match, with Elinor Snowsill and Beth Lewis both contributing more than Irish player on the pitch. n total, Wales made more than double the amount of tackles (296) than Ireland (141) managed all game. Jasmine Joyce looked in fine form again and carried the ball 15 times for her team, racking up 191 metres with the ball in hand – more than any other player and in the end it was her 70m effort that secured Wales the bonus point score. It is Ireland's worst Six Nations finish since 2006 with the coaches left with little to be cheerful about from this one apart from a good finish from youngster Beibheann Parsons alongside fellow teenager Enya Breen's ability to get over the gain-line - she made 113 metres. Parsons' 14th-minute try promised much but a slew of further chances were missed by Adam Griggs' side, as Wales, facing into the wind, levelled through Jess Kavanagh and then bounced back from Siwan Lillicrap's sin-binning to lead 12-5 at half-time thanks to captain Carys Phillips' maul try. Led by player-of-the-match Alisha Butchers, the physical Welsh pack grew in influence, continuing to force errors from the Irish lineout and scrum which missed injured lock Nichola Fryday. 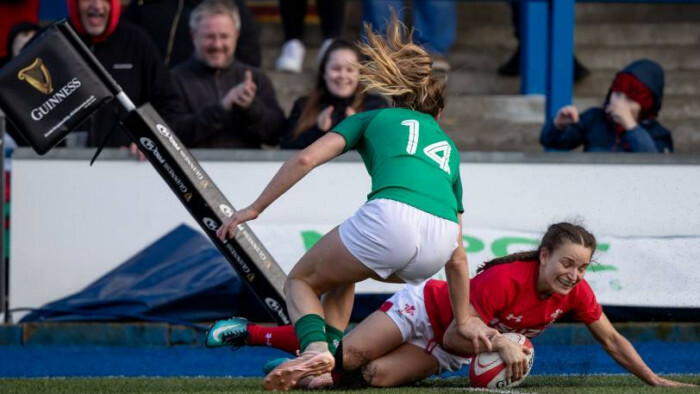 Despite having the lion's share, Ireland's scrum issues gave Wales the platform to set up flanker Bethan Lewis' 69th-minute score and the bonus point was claimed by jet-heeled winger Jasmine Joyce late on. Only with a consolation score left to aim for, Ireland were unable to respond and their four losses in the Championship now leave them in a more difficult position in terms of qualifying for the 2021 Women's Rugby World Cup. Giving his reaction afterwards, head coach Griggs said: "Wales had dominance in the set piece which really put us under pressure. When you can't get that good ball to play with, it's very hard. Fair play to Wales, they did a good job of keeping that pressure on us. "We just seemed to struggle to get line-breaks today, again we used the ball well but when we were getting ourselves to the edge of the field we couldn't penetrate through. And then that made it very hard for us to come back, and so we ended up playing a lot of rugby but not really going anywhere. "It's been a difficult Championship. It is a young squad, and days like this they really have to stand up and learn from these occasions. That's probably the message from this whole tournament, that we've done a lot of good things but then there's things that have let us down and if you don't learn from them you get punished, and that's pretty much what happened today." IRELAND 15. Lauren Delany 14. Eimear Considine 13. Enya Breen12. Sene Naoupu 11. Beibhinn Parsons10. Nicole Fowley 9. Kathryn Dane1. Lindsay Peat2. Deirbhile Nic A Bhaird3. Fiona Reidy4. Aoife McDermott5. Nichola Fryday 6. Ciara Griffin (captain)7. Claire Molloy 8. Claire McLaughlin. Replacements:16. Emma Hooban 17. Linda Djougang 18. Laura Feely 19. Edel McMahon 20. Anna Caplice 21. Nicole Cronin 22. Ellen Murphy 23. Laura Sheehan.